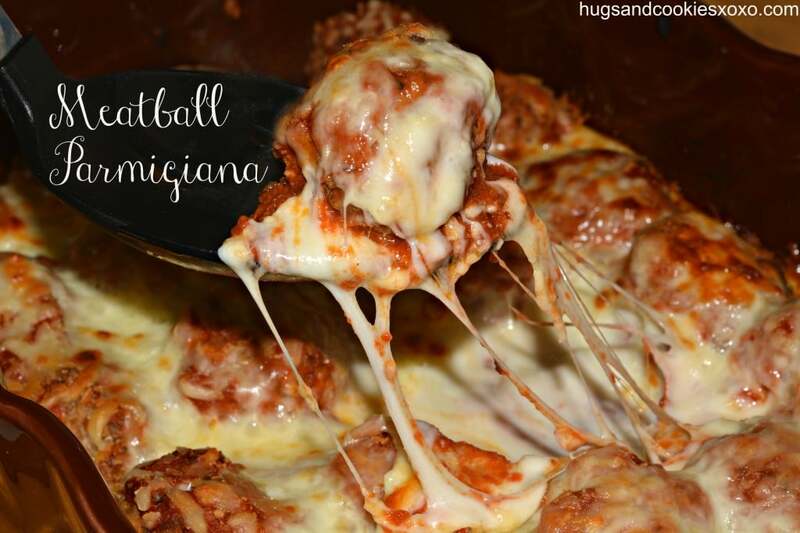 Meatball parmigiana just got a whole lot easier with my baked meatballs! No frying on the stove, no splatter, no mess! Perfect for a quick meal during the week, too! You can use your favorite jarred sauce for your baked meatball parmigiana or make this fabulous sauce that I used. Click here for the recipe! Pour 1-2 Tablespoons oil on a baking stone or pan with sides and bake at 400 for 20 minutes. Do I bake the meatballs with the oil at 400, then take them out, pour sauce and replace them? Or just Bake pan to get it warm? That’s exactly what’s going with mine. You could even serve over garlic toast! It’s in the oven right now! That’s what I did, bake pan and oil only, than added the sauce and meatballs and followed the recipe. I hope it turns ok, fin tou follow the directions that’s exactly what it says to do. Maybe edit the instructions to “arrange meatballs over oil, and bake for whatever many minutes, remove… etc etc. Some spiralized zucchini noodles in place of pasta would also make it low carb. That sounds good and Id add Italian bread and butter or garlic bread. Hoagie sounds good,, or how about a loaf of garlic bread, hollowed out and make meatball garlic loaf,, cut off a generous portion and a side salad…. Yummy. I would serve Italian veggies, sauted. Such as zucchini, green beans, red peppers and onion. Brown in OO and add some fresh oregano and parsley. Small salad also and hot bread. A nice salad would go very well with it. i’d make mine with marinated plum tomatoes, and 3 cheese garlic bread, or even just some french bread with butter…. I made it with whole green beans, garlic roasted mushrooms, salad, and bubbly cheesy garlic bread. YUM!!! One of my favorite Italian sides is Pasta with Mushrooms and it is so easy. I boil my pasta (I like the wheels for this), and drain it, place back into pot. While pasta is cooking, I saute the small package of fresh sliced mushrooms in a stick of butter. Pour over cooked pasta, add grated parmesan cheese to your liking (not too much)…and some fresh or dried parsley (1 – 2 Tablespoons). Toss till all of the pasta is covered in the buttery, cheesy goodness Voila! 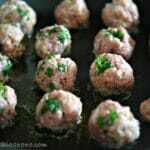 This dish, a salad, and some garlic bread would go great with these meatballs. Heaven…. I am SO making your dish!!! I am going to be making this! Sounds sooo good! An Italian Salad would be great.Cheesy bread. 1 cup of bread crumbs usually has about 20-25 grams of carbs (if the recipes makes 12 meatballs, it would be about 2 grams each). Some sauces are higher in carbs than others, so it would depend on what sauce you use. If you use a sauce lower in sugar, this would be a great low carb meal served with spaghetti squash. I just made it and it’s delicious! I will have to agree that it is most def a twist on meatloaf. I think it depends on your meat loaf. Not like mine…. But it’s in the oven. Going to serve with Garlic toast. Maybe even over the toast! It smells awesome! Leave out the breadcrumbs for lower carb version. They hold together nicely from the Parmesan cheese. These are one of my favorite things to make for low carbon diet! Great to know,Judy!! !That’s what I was wondering about.Maybe could use pork rinds chopped like breadcrumbs in the processor! You could always add a teaspoon of coconut flour instead of bread crumbs. I will definitely be making this!! Yummm yummm! Whenever I make meatballs/meatloaf/hamburger patties I always use quick cooking oatmeal. Works great to hold together and is healthier than bread crumbs. the carbs would mostly be in the bread crumbs and the tomato sauce. If you’re worried, you could go easy on the sauce and switch out bread crumbs for a bit of coconut flour or something. I use ground flax seed in place of bread crumbs. That was meant to say, ZERO calories, ZERO fat grams, and ZERO carbs!! LOL..ENJOY!! This also would make great meatball sandwiches. oh yeaaaaa now you’re thinking!!! Sounds good, add her favorite pasta with a salad and garlic bread and for dessert fresh strawberries and cream!!! Wine, candlelight and an all naturelle you. LOL Spice it up, been married 27 year, it works. OMG this looks so good, I am going to make this for my troop. I saw this recipe filed under “Gluten Free”, how can it be gluten free when bread crumbs are used in the recipe? It is specifically written that I used Schar brand breadcrumbs which are gluten free. OK, thanks. I am new to gluten free cooking and was unaware of Schar being a brand name for a gluten free bread crumb. Thanks again for the prompt reply. These look really yummy! Yes, Schar is a fabulous gluten free brand-definintely check them out!!!!! Great pizza crust too!!! You can make this low carb (Wheat Belly/Atkins) by using crushed Pork Rinds instead of bread crumbs. I’ve done it when I was on Atkins, and still do it now that I’m on Wheat Belly. Can’t tell the difference and all you do is open the bag (so it won’t explode) and using a rolling pin or a bottle/glass roll over the bag of Pork Rinds until they are crushed and measure out what you need. I usually use the regular ones, but you can also use the barbeque or the hot ones for extra flavor. MMMMMMM YUM!!!! cheesy garlic bread would be good with it. Do you have to use bread crumbs? I have never tried it without. …no, you do not have to use bread crumbs. I’ve made this dish several times and I do not use bread crumbs, that is optional. Now, if you like to use a little wheat flour or reg and few drops of skim milk. that ok too. Your meatballs will bind together just fine it’s the eggs that’s gone to help keep them moist and delicious. Receipe looks wonderful, making it tonight for my fiance. Steamed Broccoli , Broccoli Salad, Steamed Cabbage or Baby Green Lima beans are all good side dishes. Yes u need bread crumbs to bind all the ingredients. I’m gonna make this w/ground turkey….probably won’t have to cook it as long, though. ….yes, this sounds awesome & looks sooo yummy! For a healthy meal….make it w/turkey & eat w/brown rice, wheat pasta or spaghetti squash &/or with salad. I will make this really soon! The meatballs bake on their own for 20. Then in casserole dish for a total of 40. Is it one and a half pound of each types of meat? If not two 24oz. jars of sauce seems like too much. Someone let me know, I really want to make this dish. 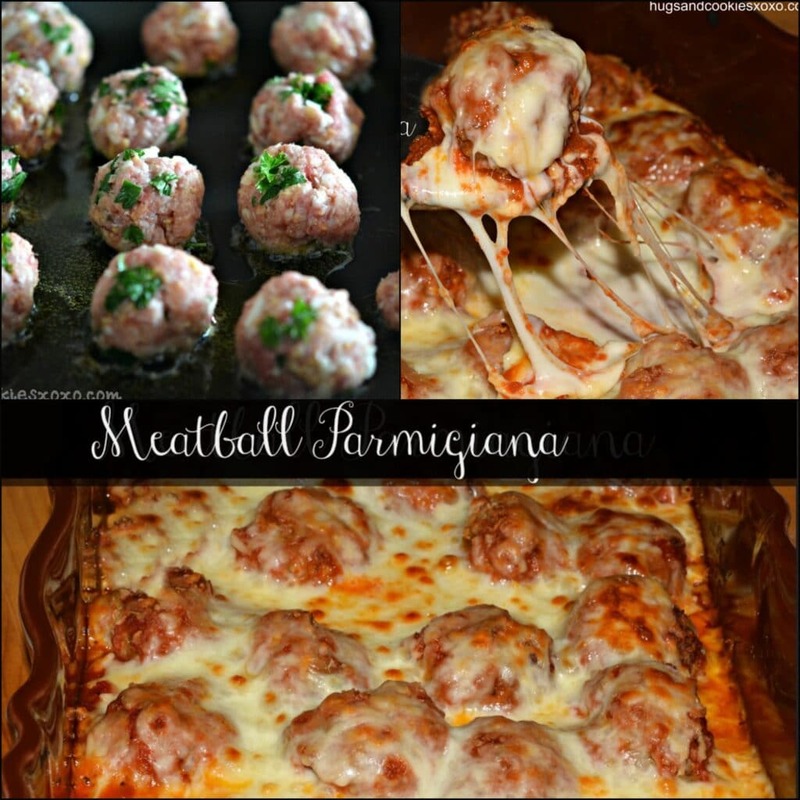 Can pre-cooked one and a half inch meatballs be used? The 1 1/2 pounds is the total. Use as much or as little sauce as you like! You do not have to use bread crumbs to bind. You can just use additional parmasean cheese. I never make my meatballs with bread crumbs or any filler other than parm cheese. You can make this and use tofu noodles on the side for a wonderful low carb dinner. I’m going to make a meatball lasagna. I love this recipe!!! I used ALOT of ink to print this. The pictures are NOT needed. Just the recipe. 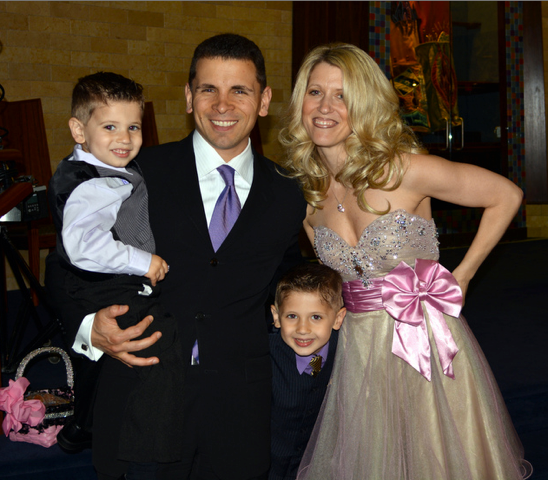 Once you click print friendly there is an option at the top to omit photos!!! 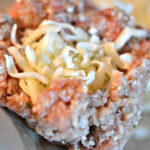 can you use the frozen cooked Italian meatballs that you find in the frozen food section of your local grocery store? WHAT? NO! defeats the purpose of a recipe to “Buy” the thing that the recipe is helping you make. Do yourself a favor and skip the store-bought. Try the recipe (not a difficult one, by any means)… you will not be disappointed. I make a similar recipe and put slices of garlic bread, upright, along the sides of the casserole dish. Sounds and looks delicious. I plan to try it soon. awesome -hope u love it! Looks delicious!!!!! Excited to try this today! Found this recipe at a great time cuz my husband just stocked up on meats from our local butcher. Thank you for sharing! How about putting a layer of cooked pasta beneath the meatballs while cooking? When you say to Pour 1-2 Tablespoons oil on a baking stone or pan with sides and bake at 400 for 20 minutes. Lower oven to 375. 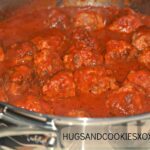 Are you saying to heat the dish first before putting the meatballs in because in the next steps it states to put meatballs on top of the sauce? Sorry, I am a very precise person so I think to hard in to things. YOu bake the meatballs first at 400 for 20 mins in oil. Then you bake them in the sauce at 375 in a casserole. Saw this and had to go get the ingredients immediately! Won them over again! Thanks for the recipe! i made this just the other day…i served a ceasar salad with it and sliced italian bread. it was amazing !!! thanks for the recipe !!! You are very welcome-so glad you liked it! I prepared this for, Sundays super it is very delicious. FYI– it requires a lot of cheese and you should use a really good sauce. The cost to make it, was about 20 bucks and it can feed up to 5 Adults. I served it with garlic toast and steamed broccoli. Don’t care much for garlic, is there anything else that you would recommend to help season the meatballs? I tried this for a big Sunday dinner served with pasta. It was a huge hit with my boyfriend! Like it says: be mindful to not make the meatballs too big! About how many meatballs does this recipe yield? Does anyone have a crock pot version of this? I currently do not have a working oven so my crock pot has become my best friend. Just wondering if anyone has tried this with Italian Sausage??? I was wondering if there is a way to freeze the meat mix before cooking it. Since there are eggs in the mix, I’m not quite sure if it’s ok I want to make this for supper this week but I’m trying to gain a little time by prepping in advance… any ideas? Thanks a lot! 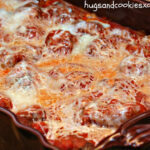 I would cook the meatballs (without sauce) before freezing them. Put them in a Ziploc bag. Then defrost them and continue on with the rest of the recipe. My mom used to make meatloafs all the time and put them in the freezer without cooking first. Made it really nice to have it made ahead to just pull out, thaw, and bake. I am making this tonight for the first time. Sounds super yummy. I decided to serve it on top of mashed potatoes, with homemade garlic bread and green beans on the side. Sounds and looks soooo good. Ok can I just use 1 1/2 pounds of ground beef instead of the other meat? Can you taste the herbs or just meat I am looking for a meatball that has bursts of flavor! Thanks! Awesome and Easy Recipe! I toasted sub buns and served these on those – HUGE hit! Thanks for posting this delicious recipe. Trying this tonight!!! So exited to find a great new recipe that’s easy for after work. I am taking a meal to a family with a new baby and they requested meatballs. I would love to give this a try but am wondering if it could be turned into a one dish meal? Can noodles or something be baked with it? Thank you! I would cook pasta separately and combine for delivery. Sorry no website. Just wanted to say they look amazing, and very tasty. I plan on trying this recipe out sometime in May or June. 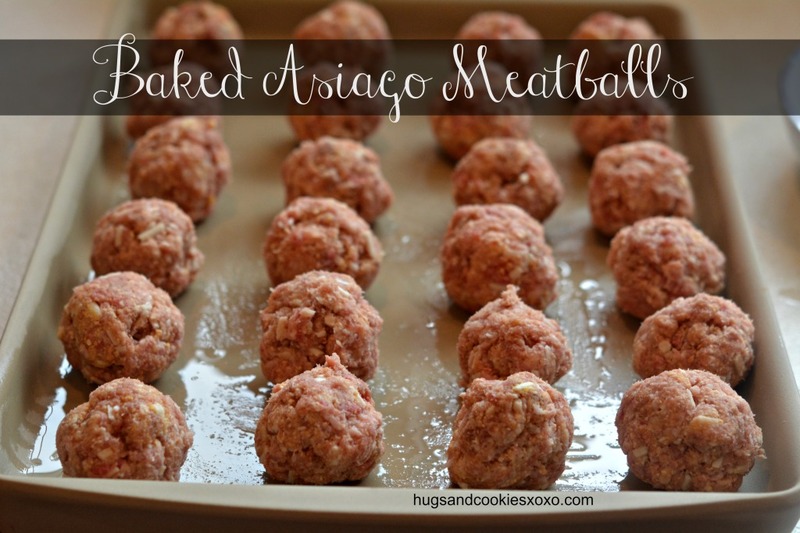 My mom has her own recipe for meatballs, but I will add the Asiago Cheese to them. Looking forward to tasting them for myself. I have never tried oatmeal in this but do have a great meatloaf with oatmeal if u need one!!! Ever tried this with Alfredo sauce? Sounds so yummy! Excellent recipe. But it should also worn people NOT to use a glass pan. Ours exploded into many pieces. I know the recipe says other options for cookware but a warning should have also been added about this possibility. I have baked in glass pyrex before with no problems. Why would yours have broken? Unless you used a broiler maybe? What a compliment! Thank you!!! Best meatballs I’ve ever made. Made these for a group of firemen and they loved them! Making again tonite for us.